Image is a representation of this item. This is a customizable part; You will be asked to choose from a list of custom features when adding this part to your shopping cart or wish list. Coverking Cordura Ballistic custom seat covers feature the same durable fabric used in luggage, outdoor equipment, footwear, and military gear--to protect your seats in the toughest environments. Long a favorite of contractors and tradesmen for their work vehicles, these long-lasting seat covers are also a great choice for family vehicles exposed to heavy wear, food and drink spills, pets, and kids. Coverking Cordura Ballistic custom seat covers are manufactured to the exact specifications of your seats, and include custom headrest, armrest, and console covers--even map pockets. The material is three times the thickness of similar products on the market, with an inner water-resistant lining for added protection. 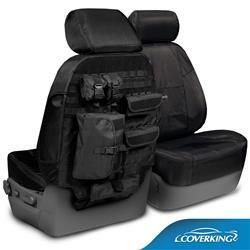 Coverking seat covers are easy to install, and over time they will mold themselves to the contour of your seats. Thank you for your question. Coverking BALLTACTICAL does have options for the built in seat belt. Please use the configurator to select the specific options for your application. Do both front seats have stuff on the back or just one? If one - which - driver or passenger? Is there a cover for the glove box? Both covers have the attachments and no, a glove box cover is not included.